Every south Indian lunch and dinner ends with curd rice. Curd rice is just mixing butter milk or curds/yogurts to the cooked rice. But adding a little seasoning to it makes it more tasty and special. Curd rice and pickle is the best combo one can have on a hot summer afternoon lunch. It makes a good picnic lunch too. 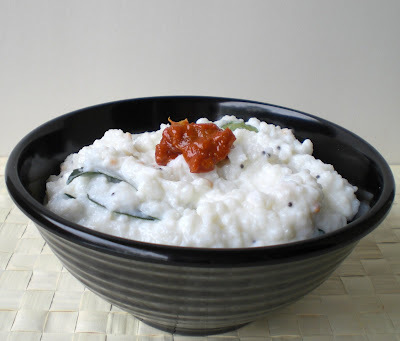 I am sending this curd rice to Fun 'n' Sun event hosted by Simple Indian Food. Add the salt to the cooked rice and mash the rice really well. Heat oil and add the mustard seeds, when it pops, add the urud dal and green chilli. When the dal turns golden brown add the seasoning to the rice. Add curry leaves and asafoetida powder to the rice and mix really well. Now add the butter milk or curds or yogurt and mix well. Serve with pickle of your choice. I have listed below, the many ways of preparing curd rice. 1. Simple Curd rice: Just mix butter milk to the cooked rice. 3. Bagalabhath: Mix a tablespoon of butter to the steaming hot white rice. Mix it until the butter melts completely. Add salt and mix well. Then, add a cup of milk and mix well. Then, half cup thick curds and mix well. This is a simple way of preparing delicious bagalabhath. Curry leaves can be added to this rice. 3. Curd rice with fruits: To the curd rice mentioned in '1' or '2', mix in finely diced apples, pomogranate seeds (washed), seed less small green grapes. 4. Curd rice with Vegetables: To the curd rice mentioned in '1' or '2', mix in grated carrot and grated or finely diced cucumber. Add finely chopped coriander leaves. 6. Special Curd Rice: Cook one cup rice with milk (if using 3 cups of water for making regular rice, add 2 cups water and 1 cup milk). Then, do the seasoning mentioned in the above recipe. Mix in half a cup curd and leave it aside for 4 hrs and serve. 7. Other varieites: roasted broken cashews can be added to any variety of curd rice listed above. You can come up with more creative ways of preparing curd rice. Enjoy the delicious curd rice. Keep cool this summer. Love the curd rice. Especially when you go out for a road trip you can beat the curd rice. Love the bowl Mythereye. My all time fav recipe. Nice entry. My staple, comforting and healthy food for summer. For my daughter I sometimes make a special Dahi-Bhaat. I add sour cream or whipping cream. It makes the curd rice more richer ( ok for kids but too fattening for adults) and creamier. Thankyou ladies for your sweet comments. Yes, it is one delicious comfort food that is anytime welcome. comforting bowl of goodness. and there r so many ways u can make it and enjoy as u have pointed out. Perfect for the scorching summers! 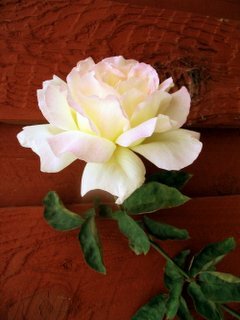 Nice post, I have posted some recipes here Check out plz and make comment on my recipe. I love curd rice.I will try it today.Thanks for the recipe.